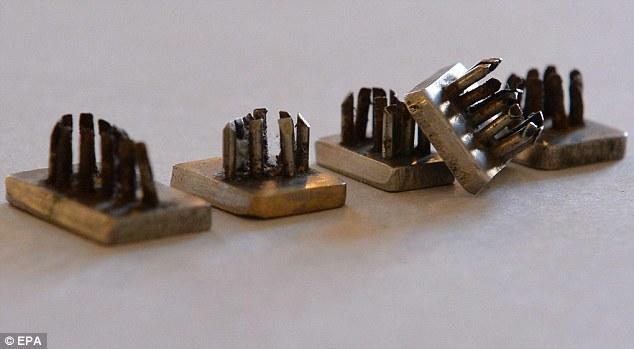 They could almost be mistaken for innocent trinkets, but these metal stamps were used to tattoo prisoners at the Auschwitz concentration camp during the early days of the holocaust before the Nazis replaced them with a more efficient system. 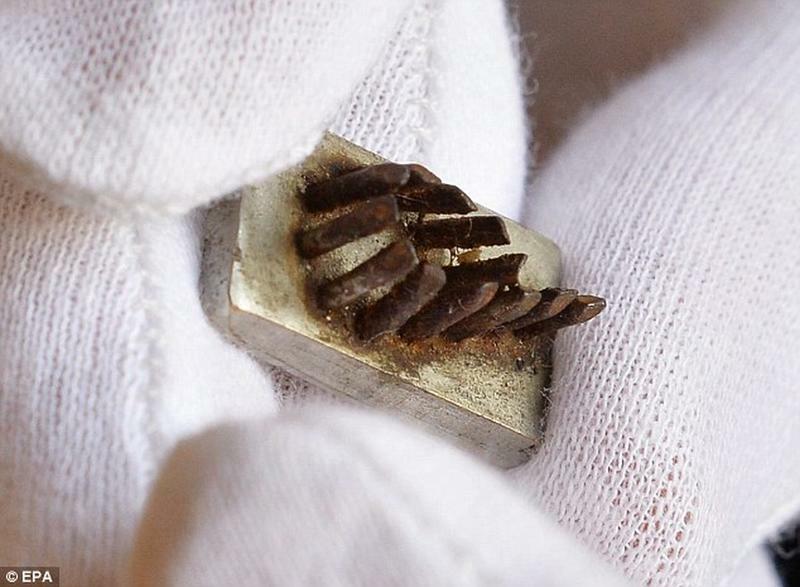 When prisoners first began to arrive at Auschwitz Camp in Poland in 1940, each one was issued with an identification number. At first the ID numbers were stamped onto pieces of cloth which the prisoners were ordered to sew onto their clothing. But prisoners would often replace their old worn-out clothes with those of others who had died causing confusion among the German prison guards. So the Nazis decided to start using tattoos instead. 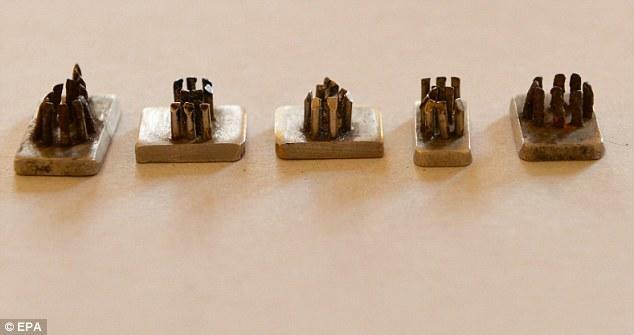 The stamps were originally thought to be the fastest method as they allowed the number to be applied in a single stroke. At first, the tattoos were applied to their left breast. The stamp perforated the skin, and ink was rubbed into the wounds producing a tattoo. 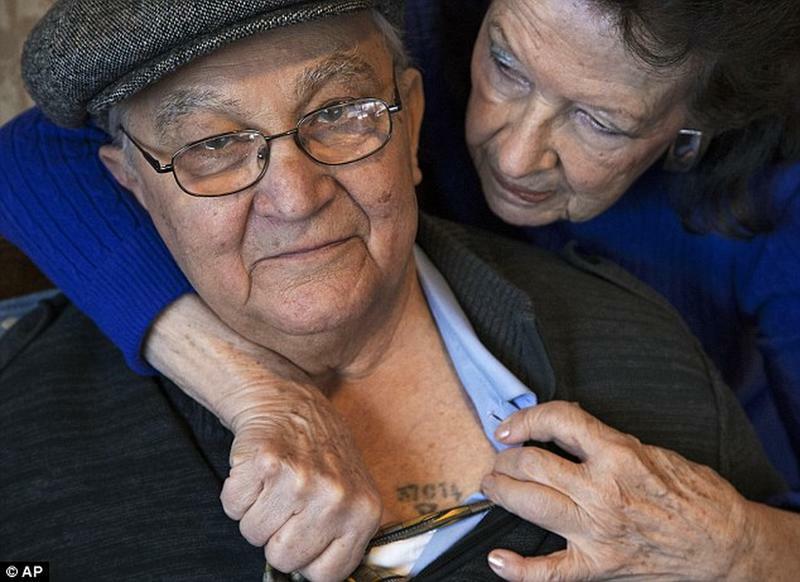 Survivor: Bessie Mittelman, 82, helps show the number tattooed on the chest of her husband Manny Mittelman, 88. He is one of the few Auschwitz survivors to have a chest tattoo. After, the stamp system was replaced prisoners were tattooed on their arms. 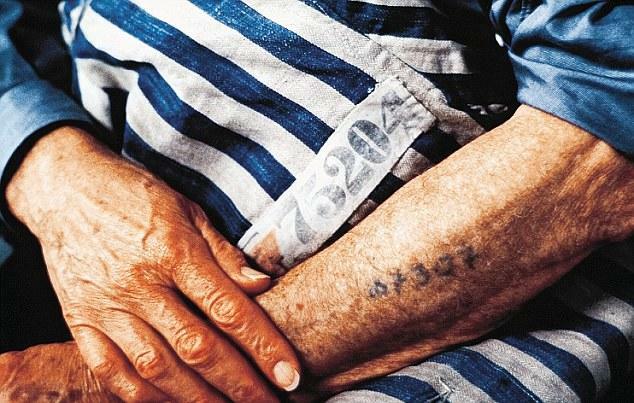 It is extremely rare now for find holocaust survivors who have their ID number tattoo on their chest as most of those interned in the early days of the camp's existence did not make it to the end of the war. The stamp system soon proved unnecessarily complex and the Nazis replaced it with a simple needle attached to a penholder which was used to apply the tattoo to the forearm.The first to be tattooed in this fashion were Soviet prisoners of war who began arriving and dying by their thousands from 1941. 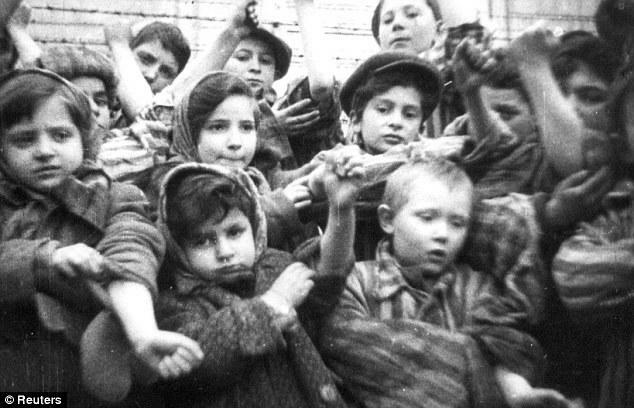 Some of the 600 children, who survived the Auschwitz, show their tattooed identification numbers. Some 7,000 prisoners, were alive when the camp was liberated. 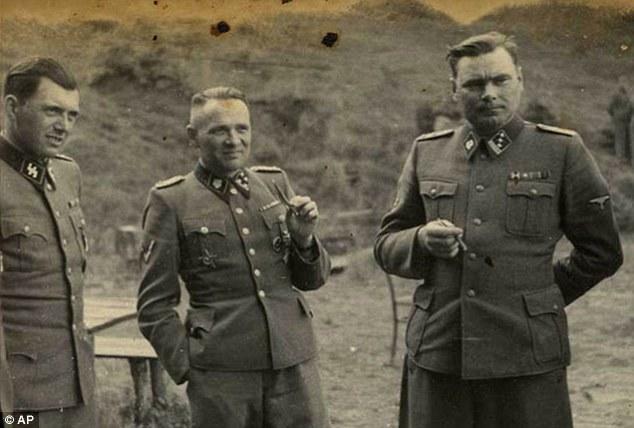 SS officers (L-R) Dr Josef Mengele, Rudolf Hoess, (former Commandant of Auschwitz), Josef Kramer (Commandant of Birkenau) are pictured at the Auschwitz in occupied Poland. 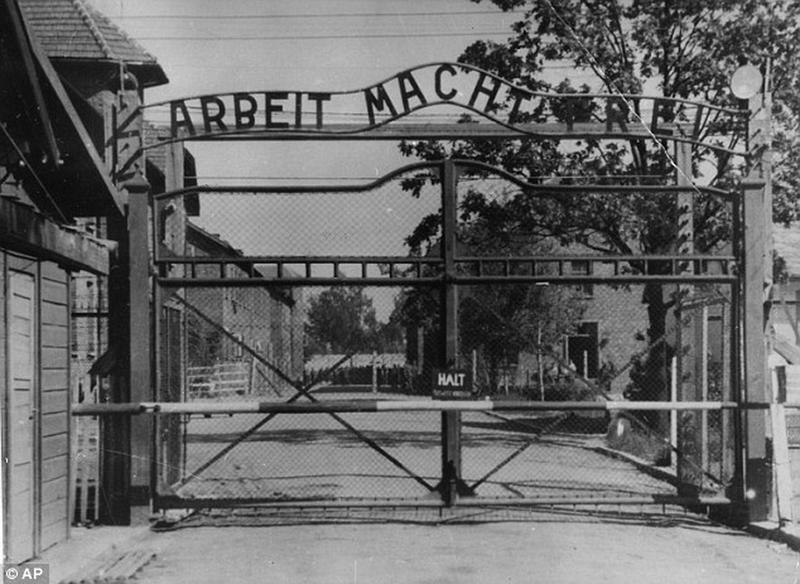 Ominously, those who did receive a tattoo on arrival at Auschwitz could actually be considered lucky, for those who did not were deemed unfit for work and sent off for immediate execution. In the spring of 1943, authorities adopted the practice of tattooing almost all previously registered and newly arrived prisoners, including females. The only exceptions were German prisoners who were held in a separate compound.